Culinary Delights from My Kitchen: Basic Vanilla Sponge Cake..Tender and Deliciously moist sweet delight! Basic Vanilla Sponge Cake..Tender and Deliciously moist sweet delight! Practice makes Perfect! An old idiom which most of have heard at least once for sure from our parents while solving those tricky arithmetic problems or physics numerical. Blah!! But it just doesn't end there. As we grow we realize that to excel in our streams we need to have the determination and that constant practice to prove our skills. I remind myself everyday when i get bogged down my pressures and failures. I love to bake and baking is a not tough but a tricky science! To master it well, it requires practice, practice and enough practice. Baking is like a love affair. Put in the right effort and ingredients and everything is wonderful. But be lazy and take shortcuts and the whole thing can go off the rails. I have spoiled enough cakes in past but i was always determined that sometime i will succeed. Yes, i did it and did it well! Happy Me! My basic vanilla sponge cake recipe is extremely easy. All it needs apart from the aforementioned ingredients is LOT of Love and Care. Take my words for it. While baking, these are main heroes which render the goodness in the cakes. I am never in a hurry when i bake, i give my complete time to it. So you also ensure while you bake a cake next time, this one or any other recipe, you bake it wholeheartedly. Surely, it will be a perfect bake! So if you have some unannounced guests at your home and you need to please them with fresh baked cake, then this can surely be your savior! 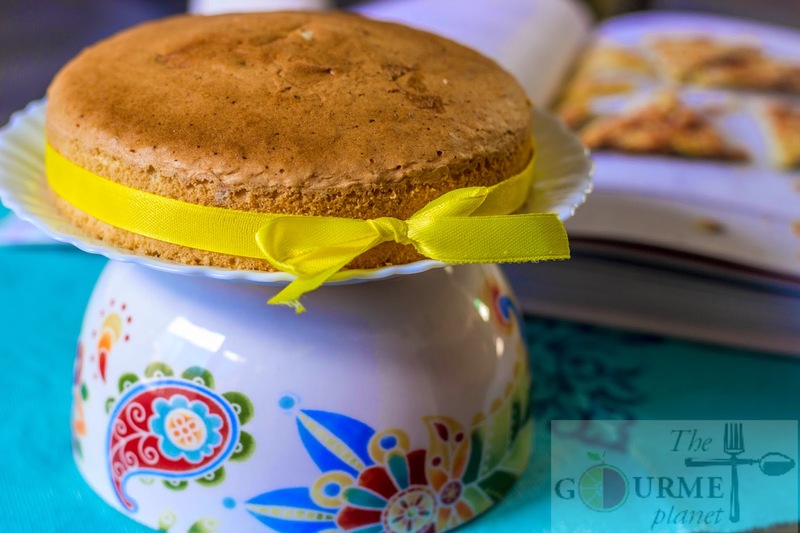 My version of sponge cake can be used as a tea time cake with some vanilla or ganache frosting on it or can be the base cake for pineapple cake or fresh fruit cake. 2. Grease a 6'' diameter round cake tin with butter and dust with flour and place on a baking tray. 3. Take a bowl and beat the eggs, sugar with the help of a stand mixer or hand whisk until the sugar has dissolved completely and the mixture is light and fluffy. 4. Pour in vanilla extract, lemon juice and a pinch of salt and give a final whisk. 5. Add the flour in batches and fold in gently in the egg mix. 6. Fill in the cake tin and bake at 180 degree Celsius for approx. 30 mins or till the tooth pick comes out clean when inserted in the center of the cake. 7. Turn of the oven and let the cake stay inside for another 5-10 mins. 9. Cut into slices and drizzle some chocolate syrup topped with some nuts or you can use the complete sponge for making cream cakes for celebrations.